Code Signing Certificates allow you to add digital signatures to your executables, enable software developers to include information about themselves and the integrity of their code with their software. The end users that download digitally signed 32-bit or 64-bit executable files (.exe, .ocx, .dll, .cab, and more) can be confident that the code really comes from you and has not been altered or corrupted since it was signed. Your customers need assurance that what they're downloading was made by a reputable company. Your customers need assurance that what they're downloading hasn't been tampered with. Only a Code Signing Certificate can accomplish both. 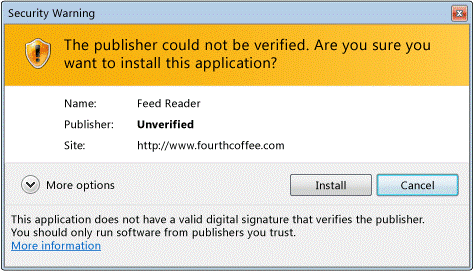 Nothing kills a download faster than a browser warning stating that a software's publisher couldn't be verified. Some mobile devices won't even give you the option to download apps from unknown sources unless you go through several steps to enable them. People aren't going to do that. If you want to convert, you need a code signing certificate. It's the only way to verify publisher identity. In the days of brick and mortar stores, customers purchasing software had 'shrink wrap' assurance. That is, if the shrink wrap was intact, they felt comfortable purchasing the software. In the age of downloads, Code Signing has replaced shrink wrap-in addition to verifying identity, it also confirms that a piece of software comes as intended and hasn't been tampered with. What Platforms can I Sign On? Some browser filters require more work than the others. Microsoft SmartScreen is one of the most stringent ones. To be trusted by Microsoft, you need to earn application reputation. The only way to do that is with Extended Validation (EV) Code Signing. EV Code Signing boosts your SmartScreen reputation and gets your software trusted. That's right, EV Code Signing is the only way to assure trusted status in SmartScreen.